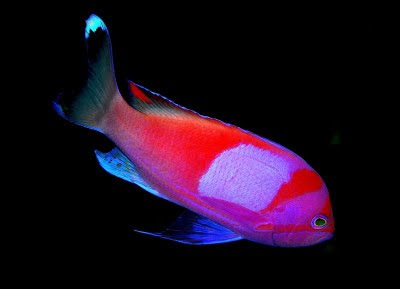 The Squareback Anthias or Pseudanthias pleurotaenia is a saltwater fish that goes by a few different names including the Purple Blotch Basslet, Squareblock, Mirror Anthias, Square-Spot Fairy Basslet and Squarespot. Females of this species are yellow with a purple underside. Males are mostly pink with a purple underside and a lighter colored rectangle on their sides. They are not particularly large, only growing to about 4" in length.